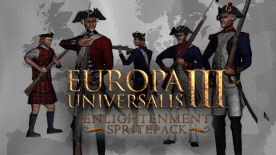 This spritepack includes 16 new sprites for the Western countries in the Enlightenment era of 1700 to 1795. Sixteen historically authentic modeled units for the “Age of Enlightenment” with new animations, for a more realistic and beautiful game atmosphere. Units are equipped with muskets, sabres, tricorn and wig. The generic western units are embellished for this period, too.